Aggrieved presidential aspirants on the platform of the All Progressives Congress, APC, have stated that the continued stay of former Edo State Governor, Comrade Adams Oshiomhole as the party Chairman is a recipe for perpetual crisis. The aspirants also pointed out that President Buhari appears to be indecisive in sacking Oshiomhole as the party chairman, but that those advising him to retain Oshiomhole have hidden agenda. In a statement made available to DAILY POST by Dr. SKC Ogbonnia, Alhaji Mumakai Unagha on behalf of the coalition of former 2019 APC Presidential aspirants, the aggrieved members said that while they strongly condemn party leaders who are hell-bent in foisting their relatives or cronies on the masses, their inquiry into Edo State had shown that Oshiomhole’s defensive brouhaha was more of the pot calling the kettle black. The statement added, “Following a disastrous primary season where many bonafide aspirants under the platform of the All Progressive Congress (APC) were mysteriously disenfranchised, we called for the removal of the National Chairman of the party, Comrade Adams Oshiomhole, by invoking Article 21 of the APC Constitution. “Since then, we have received tremendous support from the party faithful as well as critical opposition from the sympathizers of the embattled chairman. “Forty days after the call, the problem continues. The APC crisis is deepening day-by-day in all states and zones with Adam Oshiomhole as the central character. Though Oshiomhole continually attempts to claim innocence by hiding behind the difficulties that come with change and the isolated cases in Imo, Ogun, and Zamfara States; his excuses have become mundane. 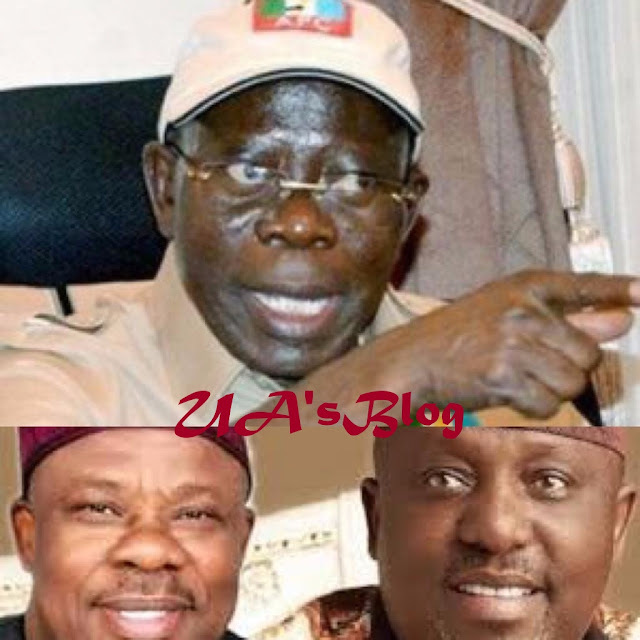 “While we strongly condemn party leaders who are hell-bent in foisting their relatives or cronies on the masses, our inquiry into Edo State has shown that Oshiomhole’s defensive brouhaha is more of the pot calling the kettle black. “We must not fail to applaud President Muhammadu Buhari for heeding our advice to wade into the crisis. Unfortunately, however, Mr. President appears to be indecisive in affecting the desired change. “He ought to recognize that the unscrupulous elements advising him to retain Oshiomhole have hidden agenda. In short, the continued stay of the former Edo governor as party chairman is a recipe for perpetual crisis. “The famous comrade is well-known to be intemperately talkative, hyperbolic, and belligerent. Recent events have shown that the more he talks, the more crisis he creates; and he does not know how to stop talking. ”Today, instead of uniting to strategize on how to win the 2019 elections, the party is faced with unending dimensions of crisis surrounding its chairman. Enough is enough. “We cannot sit idly by while an individual is being used to destroy our great party and its chances in 2019. Therefore, anyone supporting Adams Aliyu Oshiomhole as the chairman is an enemy of the APC, President Buhari, and Nigeria in general. ”Comrade Oshiomhole is a very controversial figure, who only thrives in controversy, and thus not suitable for his current position. “Yet, the APC is a large party with a huge tent. There will always be an ideal role for the comrade after he exits as party chairman. Deploying the former Edo governor as an attack dog for the 2019 elections is a win-win.